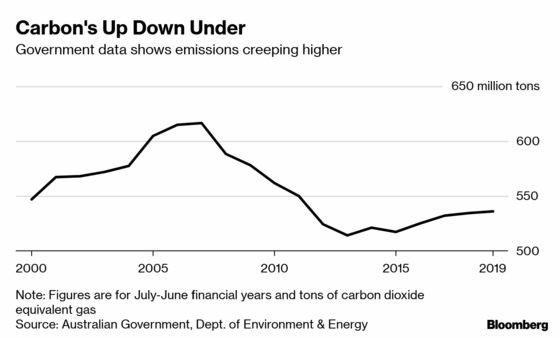 (Bloomberg) -- Australia’s opposition Labor Party ruled out taxpayer support for new coal-fired power plants if it wins office in May, as energy and climate policy becomes a key election battleground. A Labor government wouldn’t subsidize new coal-based generation projects, Mark Butler, the shadow minister for energy and climate change, said in a Bloomberg Television interview Wednesday. That’s in stark contrast to Prime Minister Scott Morrison, who has championed the fossil fuel and said Tuesday he’s considering underwriting the upgrade of an existing plant. Energy policy is a key election issue, with Labor, currently ahead in the polls, pledging much deeper emission cuts than the government and a major spending boost for clean energy projects. Labor is targeting a 45 percent cut in emissions from 2005 levels by 2030, and Butler rejected the government’s claim that such an ambitious reduction would cause major damage to the economy. He cited modeling that showed real GDP expansion wouldn’t be materially different in the next decade compared to growth if Australia stuck with its current Paris Agreement goal of a minimum 26 percent emissions cut. Butler said Labor would detail further energy policy plans in coming weeks, including whether it would include carry-over credits from the earlier Kyoto accord to help achieve its 45 percent target. “We’re interested in genuine emissions reduction, not accounting tricks,” he said. Industry needs energy policy that’s “stable and enduring” to provide an environment to allow for much needed investment in new generation, Butler said.